The Madurai Bench of Madras High Court on Monday said it would pass orders on a batch of appeals filed by 35 crew members, including 14 Estonians, of the anti-piracy ship Seaman Guard Ohio arrested in October 2013 and sentenced to prison last January. Justice A. M. Basheer Ahamed announced the scheduled ruling after hearing the sides involved, the Times of India reported. The same was confirmed by the BBC on Monday, which said that an appeal hearing for six British citizens who have been imprisoned in India since 2013 has ended, but they must wait a week before receiving a judgement. 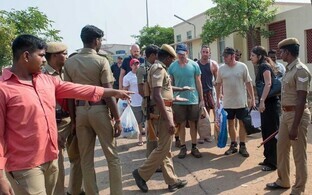 The crew of the Seaman Guard Ohio, which was intercepted by the Indian Coast Guard off Tuticorin Port in October 2013, included 14 Estonians, six British nationals, three Ukrainians and 12 Indians. 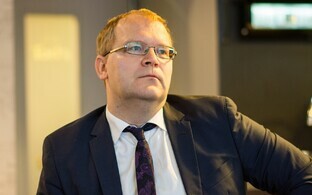 The prosecution took the floor for the last time in the Madurai court on Monday, and now the court's decision must be awaited, spokespeople for Estonia's Ministry of Foreign Affairs told BNS on Tuesday. The handling of the convicted crew members' appeal resumed at the beginning of November, almost a year after the ship guards had presented their arguments in support of the appeal. According to the Times of India, the ship guards claimed in their appeal that they were innocent and possessed weapons for anti-piracy activities. The court had turned down their pleas to suspend the sentence on Feb. 29 and continued hearings with a view to potentially setting aside the judgment. The crew members had argued that the trial court failed to consider the actual facts and circumstances of the case and wrongly held that the appellants failed to produce adequate proof on the crew's claim that the vessel was in distress. As a matter of fact, they claimed, the vessel had run out of diesel by the time the Coast Guard intercepted it, the master had communicated about it with the company, and the logbook entries would reveal the truth. Besides, the trial court did not take into consideration the cross-examination of the prosecution's witnesses 1 and 2 by the defense, which established that the vessel was outside the territorial waters of India. They also said that the lower court's holding that there was a proper registration certificate for the vessel was wrong. The prosecution argued that it was not known why the crew had entered Indian territory without permission and why they had kept arms during the vessel's stay in the Indian Ocean for 48 hours, the Times of India reported. On Oct. 18, 2013, police in Tamil Nadu arrested 35 crew and security personnel on board the anti-piracy vessel Seaman Guard Ohio, including 14 Estonian citizens as well as citizens of the UK, Ukraine and India. They were charged in December of the same year with illegal refueling, illegal handling of firearms and illegal entry into territorial waters, and released on bail in April 2014. After being handled in various court instances, the case was returned by India's Supreme Court to the Tuticorin Magistrate Court, which on Jan. 11, 2016, sentenced the men to five years' imprisonment for entering India with weapons. At the end of January, the ship guards decided to appeal the verdict and applied for bail. The bail application was rejected on Feb. 29, but the court decided to continue appeal hearings, which were subsequently postponed multiple times before finally taking place in October and November. The court wrapped up the appeal hearings on Nov. 30. 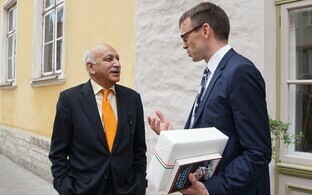 On Nov. 15, Estonia and India signed an agreement on the transfer of sentenced persons, ratified by the Riigikogu in February 2017, whereby Indian and Estonian citizens sentenced to prison in the other country could serve out their sentences in their respective home country. The agreement cannot be applied to the Estonian ship guards until their sentence has taken effect, however, which means that the ship guards would first have to drop their appeal or the appeal would have to be completed.